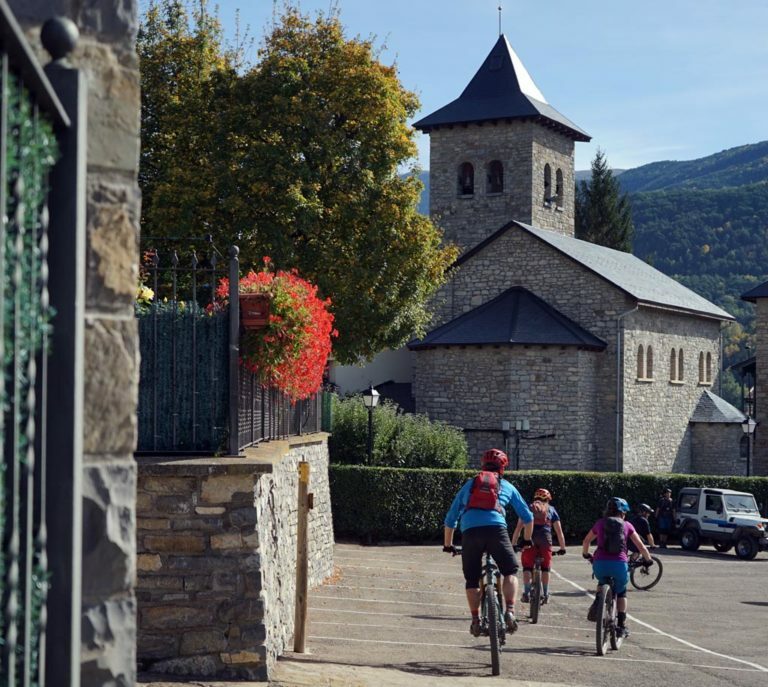 On the fifth day of our mountain bike tour in the Pyrenees with BasqueMTB we arrived in the small town of Biescas in Val de Tena, a place with 1,100 full-time year-round residents. 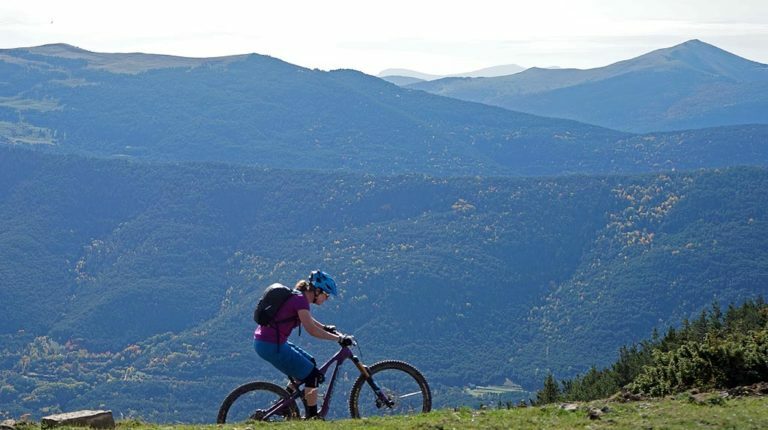 Biescas has a similar story to many places in the Pyrenees. Much of the population left for larger towns, brighter lights, and jobs in the cities of Spain. 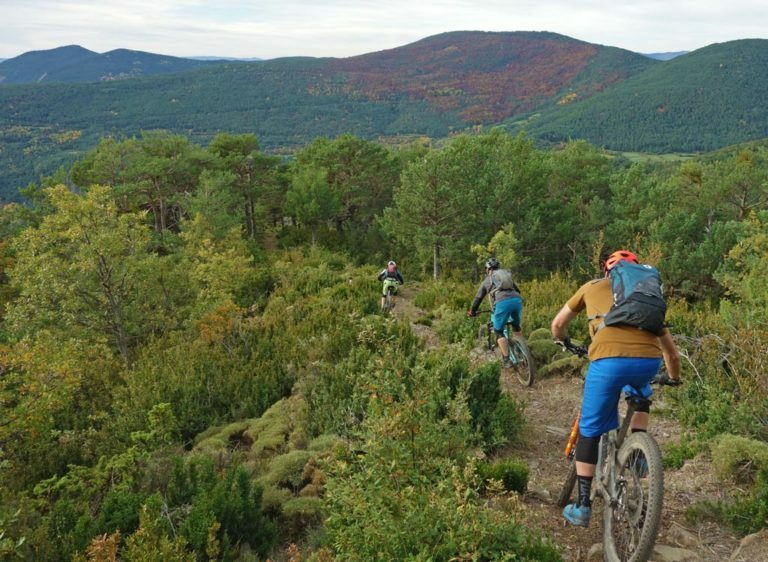 But today the people of Biescas are hoping to bring year-round tourism to support local workers, much like Zona Zero in the Ainsa/Sobrarbre region has. 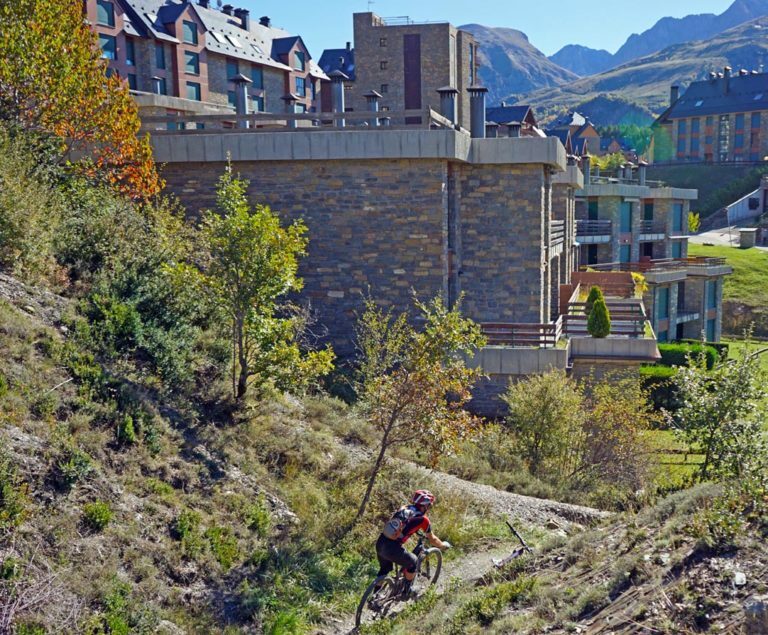 Biescas is located at just 875m above sea level, near Valle de Tena, a North-South running valley that was carved by glaciers, home to the highest concentration of 3,000m peaks in the Pyrenees. 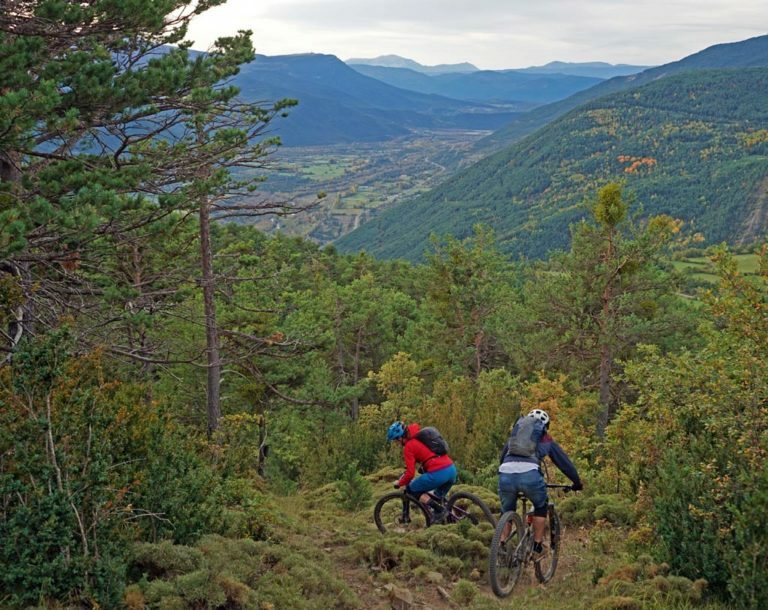 Historically an agricultural area, it is now a destination for skiers, hikers, and increasingly, bikers. 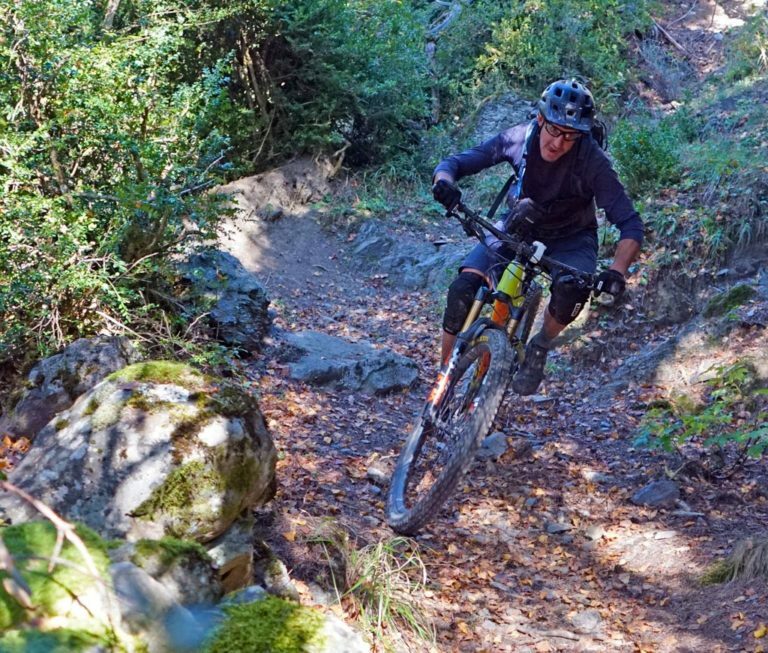 Our shuttle driver Andres is the main trail builder here. 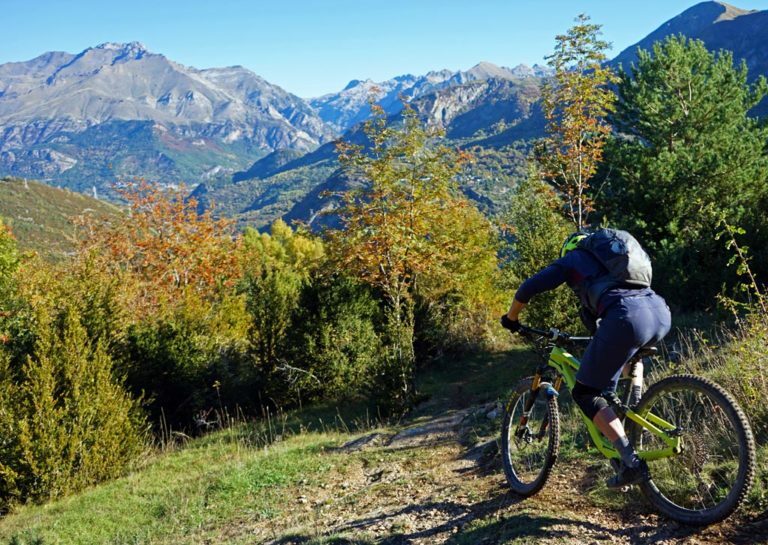 He’s the primary trail worker in Biescas and gets by on the odd grant from the town while putting in countless hours of volunteer time shaping the land. 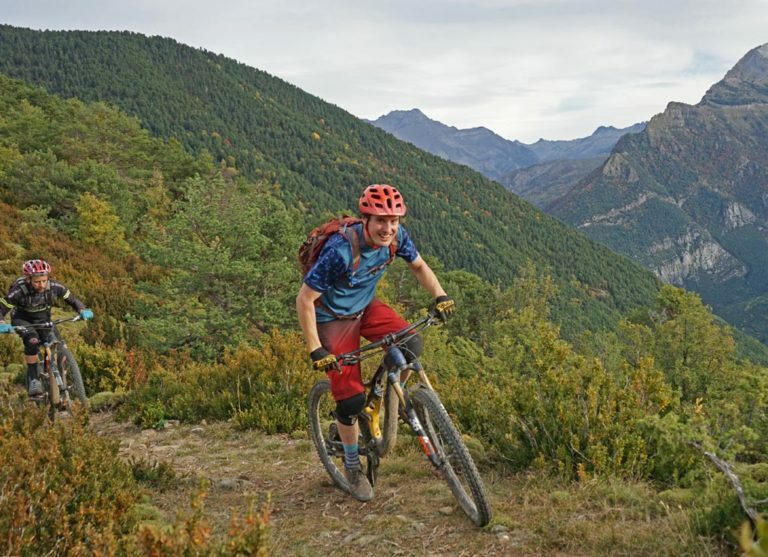 He is also chief maintainer, map maker, sign poster, and head janitor for the region’s fledgling sports and tourism initiative BTT Pirineos Alto Gállego. 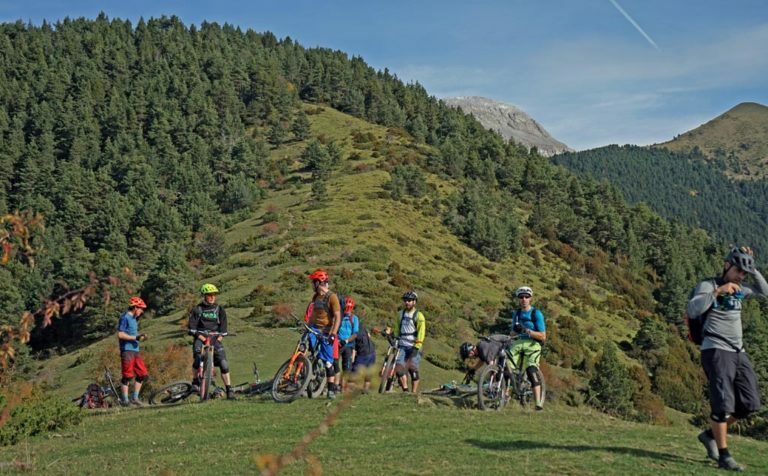 As with Zona Zero, the BTT Pirineos initiative aims to bring together all aspects of the tourism industry in Biescas, including hotels, restaurants, adventure tourism companies, and transportation companies. 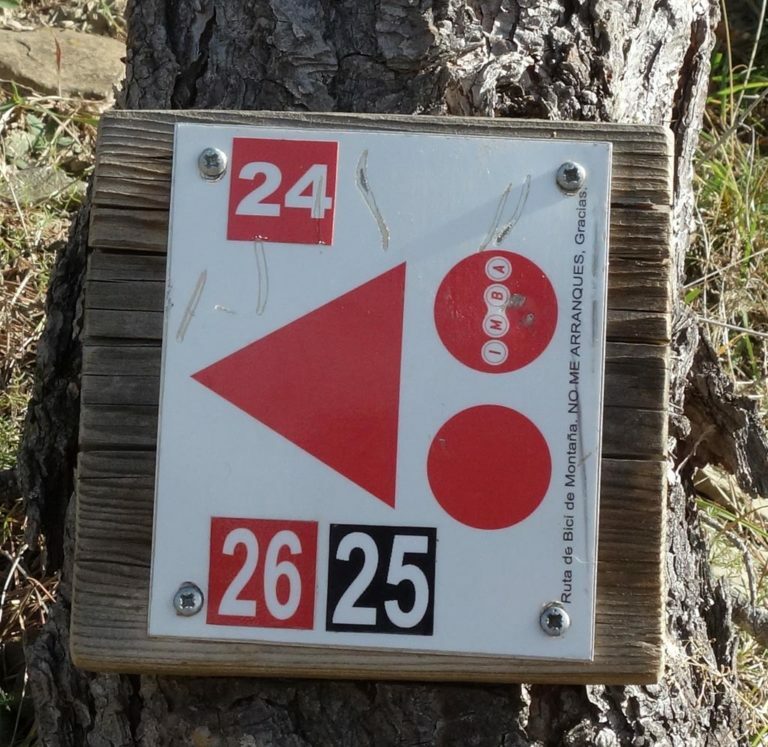 Part of their work involves erecting trail signs and providing maps of the area. 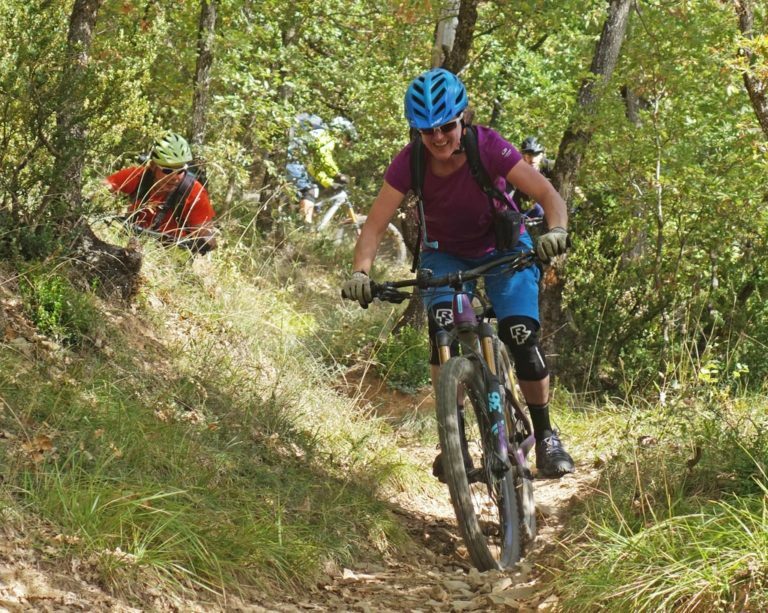 However, due to land ownership issues and the ever-changing nature of trails in general, not all of the trails are present on the map. 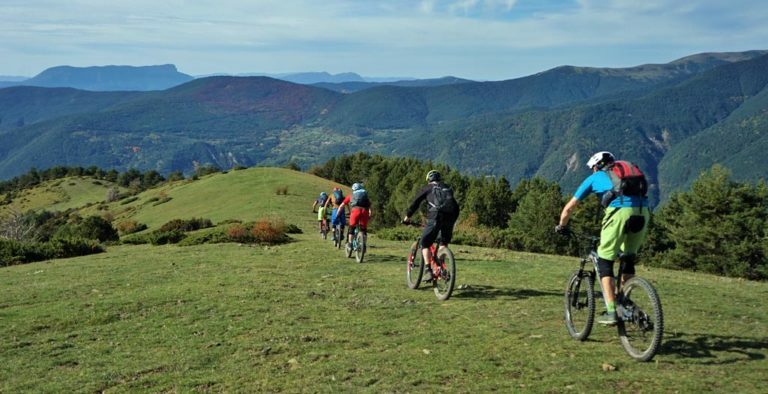 This is another reason to utilize a service like BasqueMTB that can coordinate a local guide like Andreas to find the best trails. 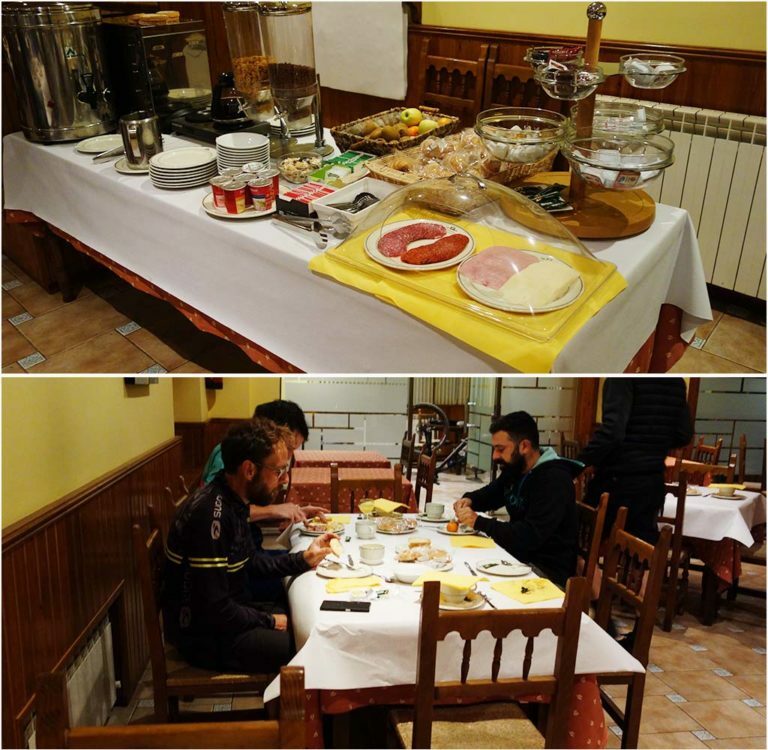 Full breakfast at La Rambla Hotel in Biescas. They went out of their way to accommodate us and our bike-repair needs, which after 5 days of hard riding, were getting rather pronounced. 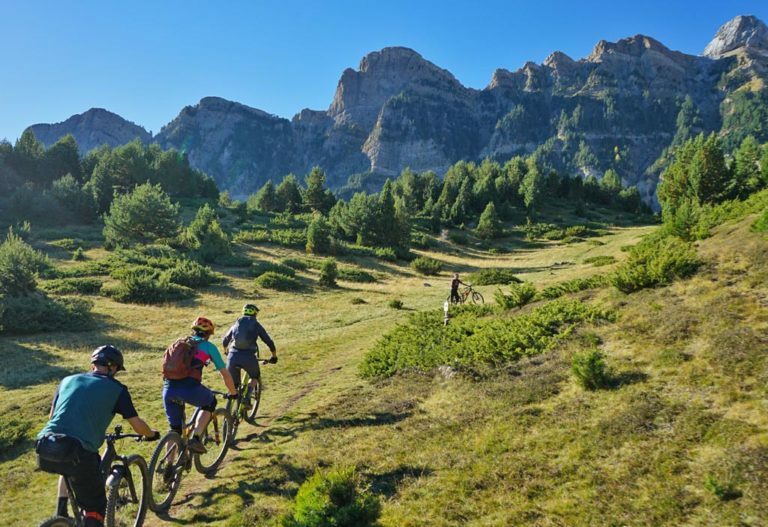 Our Biescas rides involved a traverse of alpine trails in the Val de Tena and rides in the Panticosa ski area covering both sides of the valley. By this time we were used to stunningly good weather and stupendous views. 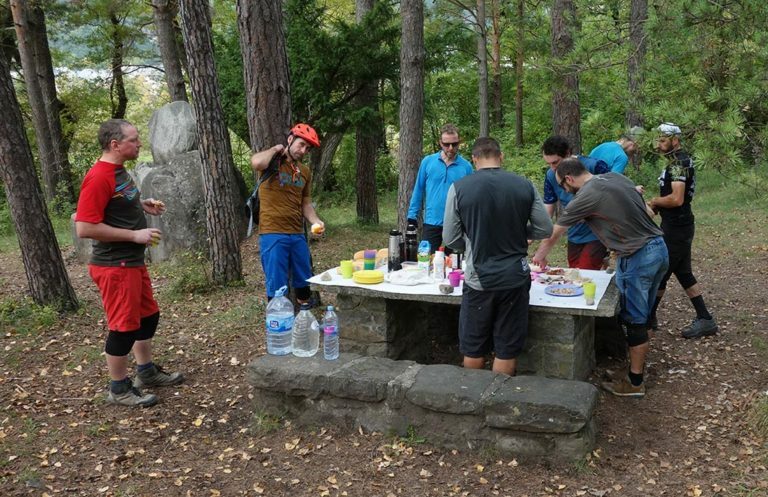 Luckily we were also used to consuming massive quantities of food in preparation for a lot of riding. 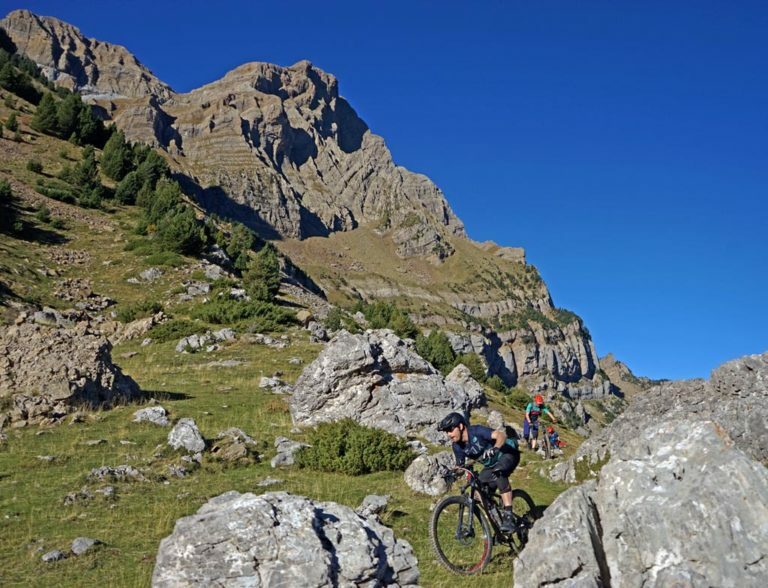 Today was no exception as we descended 2,500m on one ride from the Val de Tena at Piedrafita Lake. 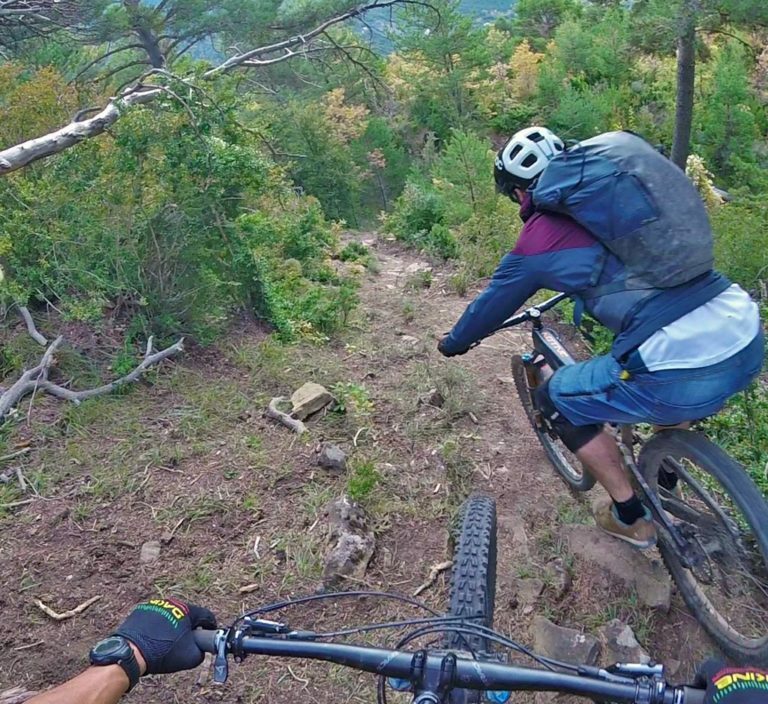 We then had two uplifts and mostly downhill laps at the ski areas of Panticosa and Santa Elena. Pickup by Andres in the morning. 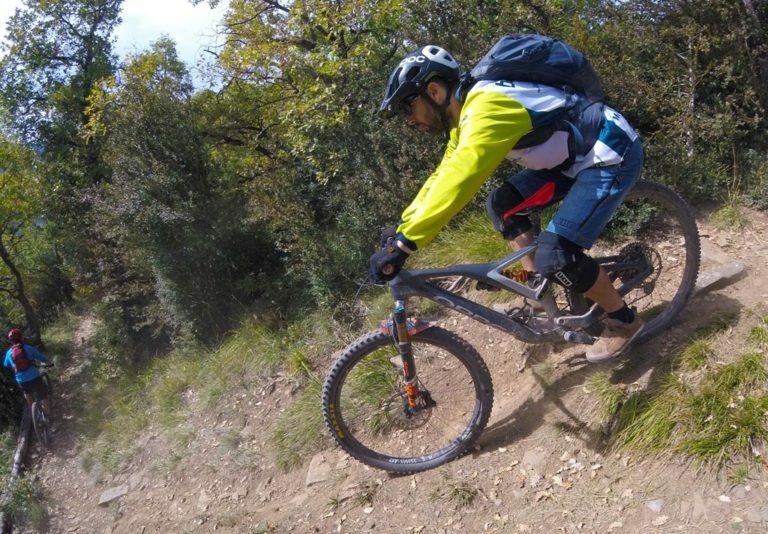 Andres runs PirineosMTB which provides enduro style riding tours locally. 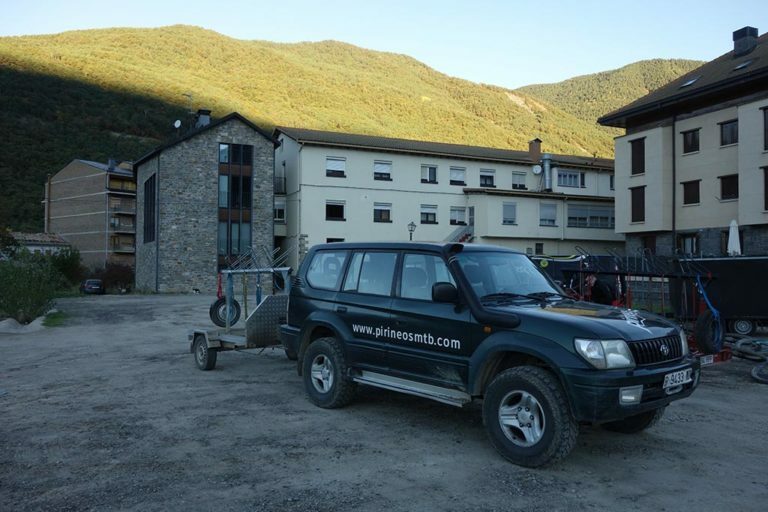 Shuttle to Lake Piedrafita in Valle de Tena. Valle de Tena is mind-blowingly beautiful. 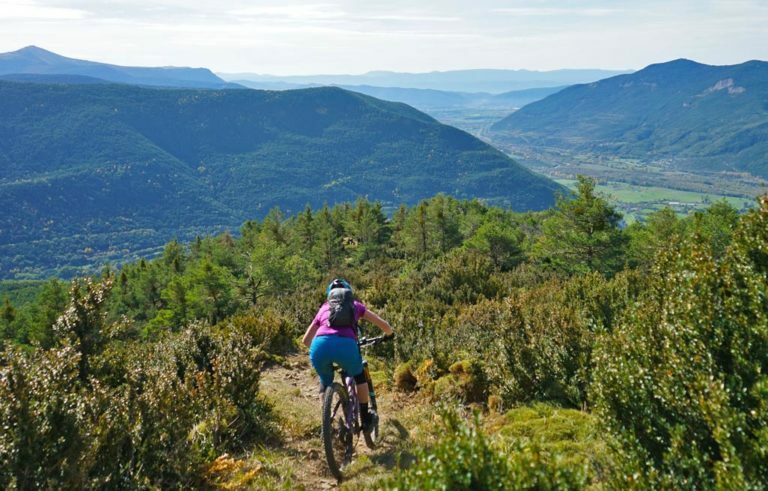 Even by Pyrenees standards where every valley and its peaks look like they’re carved out of the ground by worshippers of aesthetic lines, the valley’s lines are hard to describe. For skiers the place is lousy with couloirs and rowdy chutes. 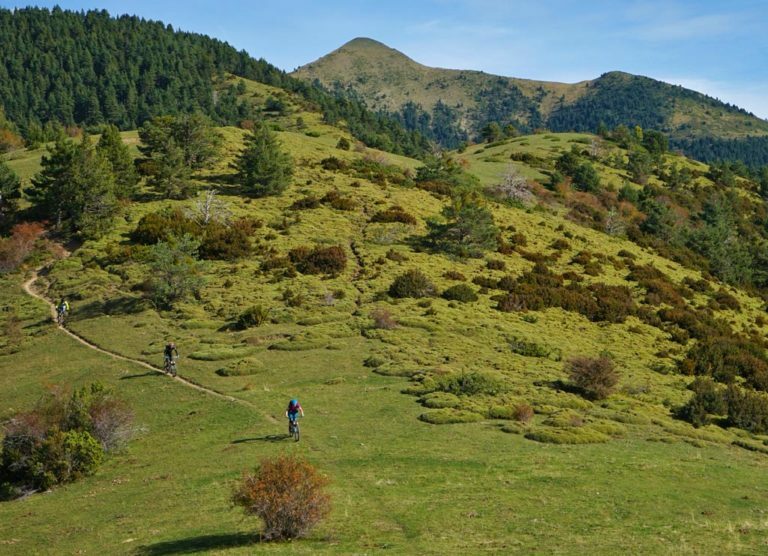 For hikers, there are meadows, lakes, furrows, caves, cracks, and views galore. 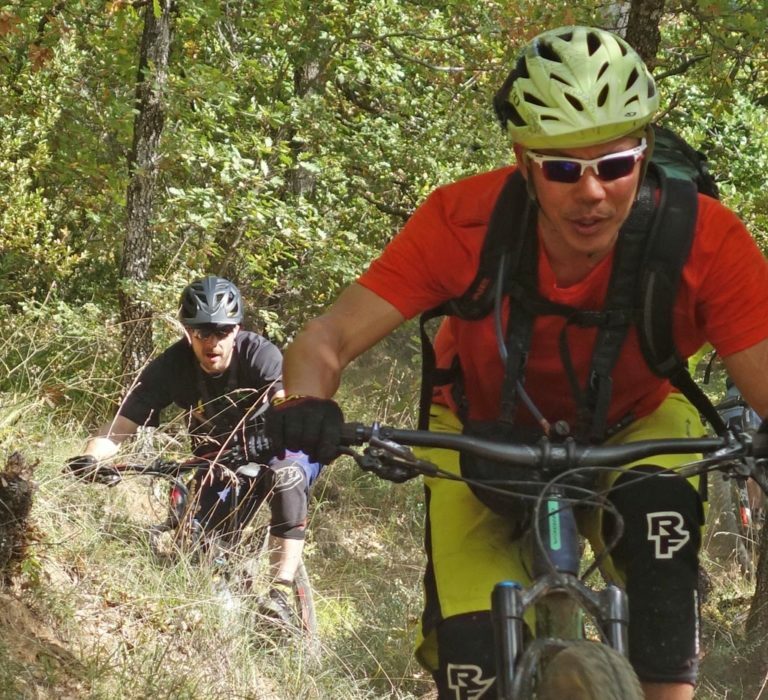 And for mountain bikers? 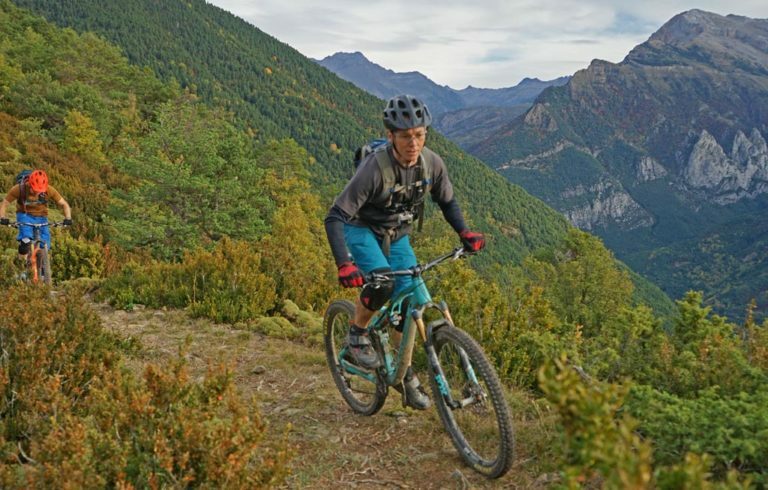 Well there’s a reason that Andres’ PirineosMTB enduro tour runs dedicated mountain bike trips, either hut-to-hut utilizing Pyreneean refugios or via town-based trips. 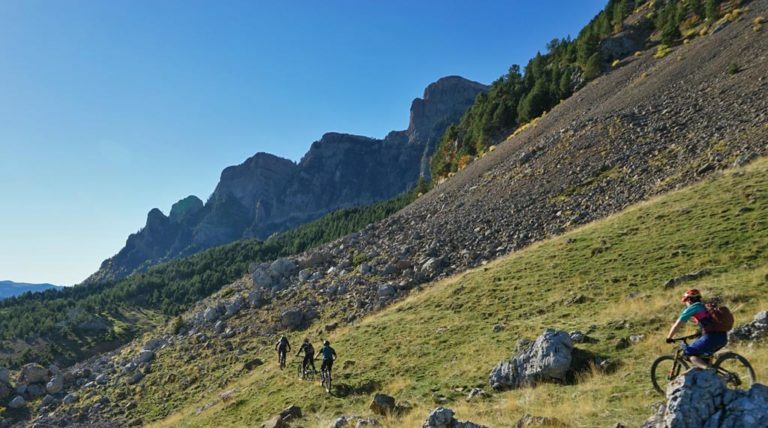 If anything showcases the remoteness of the Pyrenees and the relative absence of people, it’s the trails surrounding Biescas and winding their way through the Val de Tena. 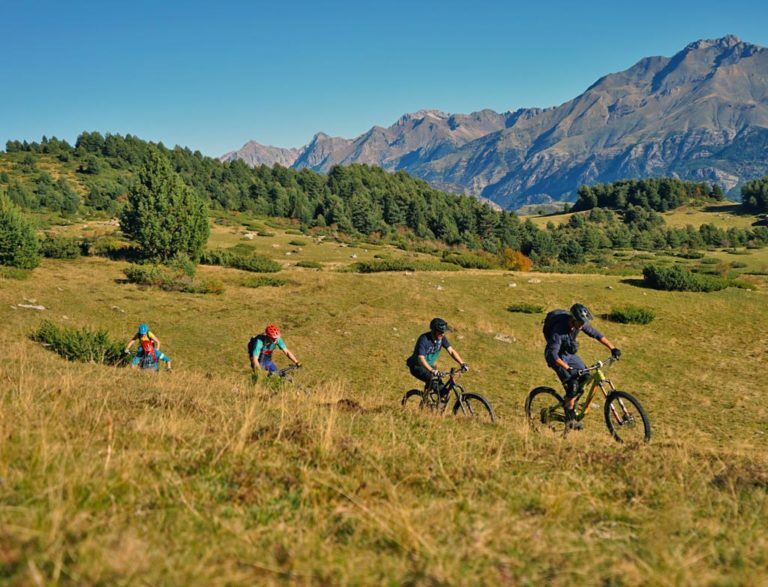 A jaunt along the alpine. 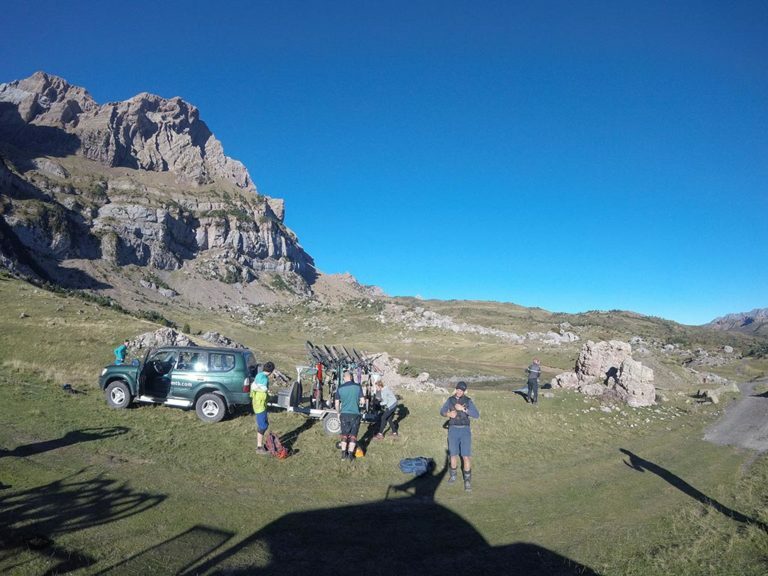 Borja leading things out as we drop in from the alpine, down to valley the floor. On the road to France! Setting up for the second run of Panticosa. 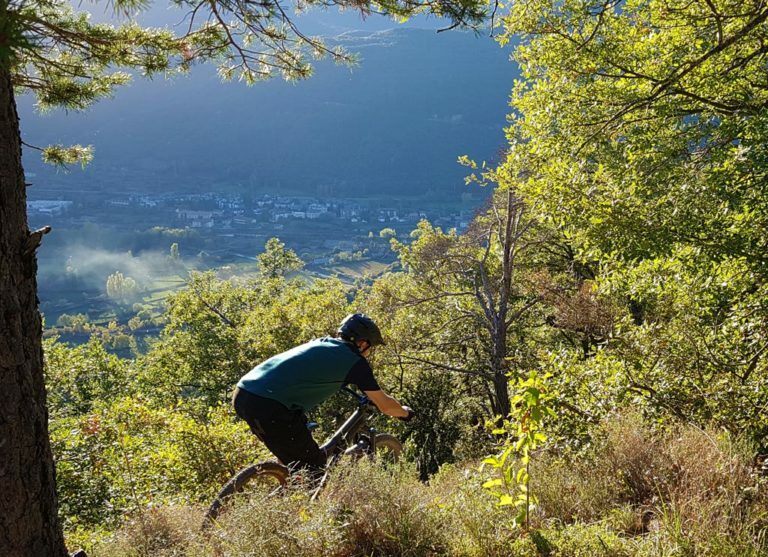 These trails are mint! Even covered in leaves they were fast and flowy. Coming into Panticosa for lunch. 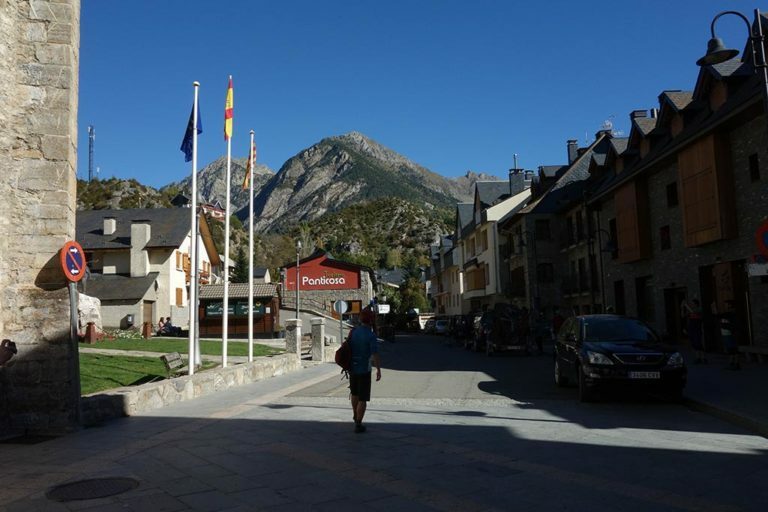 The town of Panticosa was deserted during our shoulder season visit but comes alive for the ski season. On our third run, we came to this fortification that was built in the Franco years. Just in case France wanted to invade. 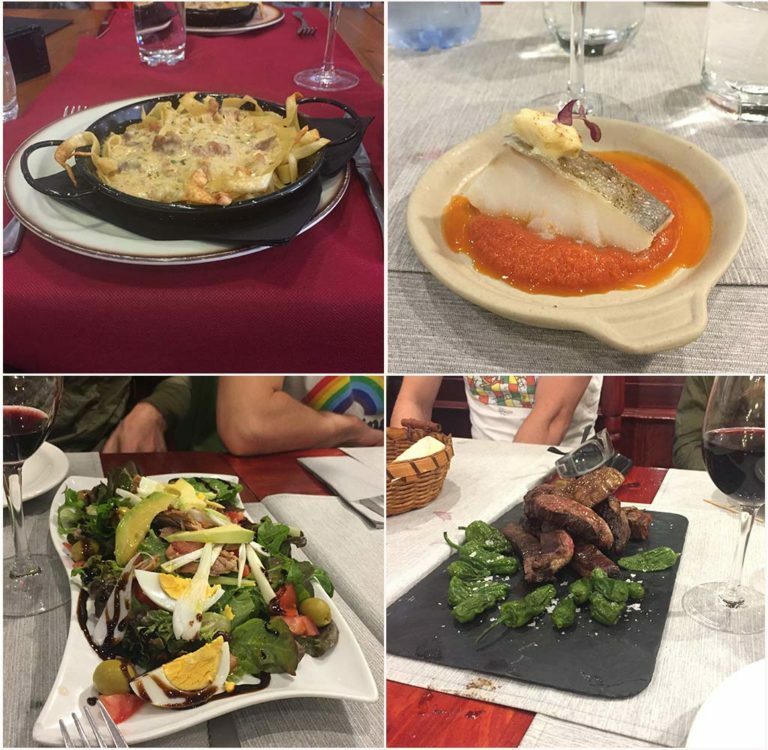 Back in Biescas we had beer at the hotel, vegged a bit, then went to La Borda del Bosnerau for a special Spanish dinner of many plates. 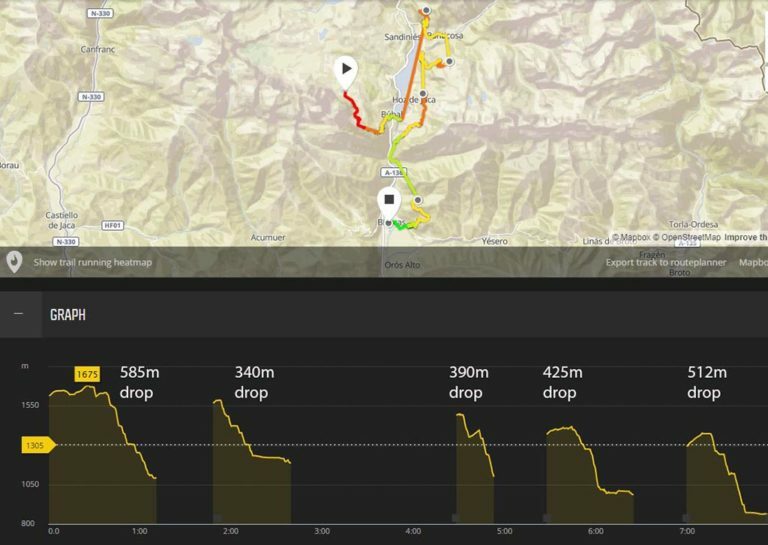 Elevation profile for day five. 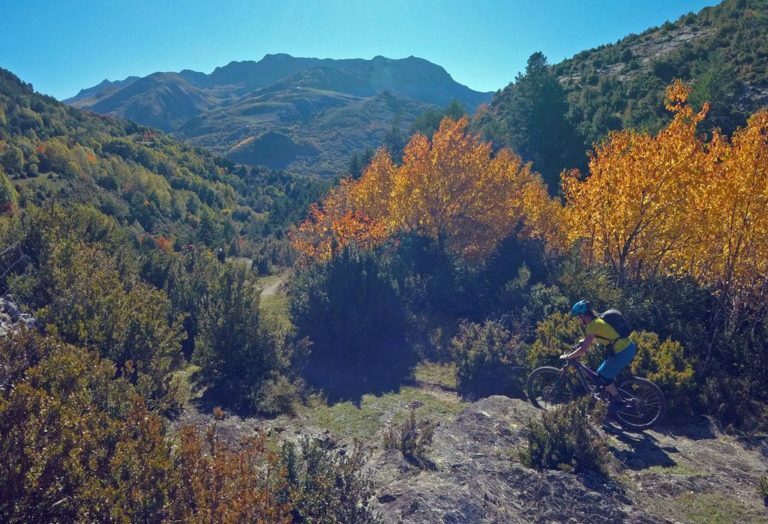 This was our last day of riding in the Pyrenees with BasqueMTB. 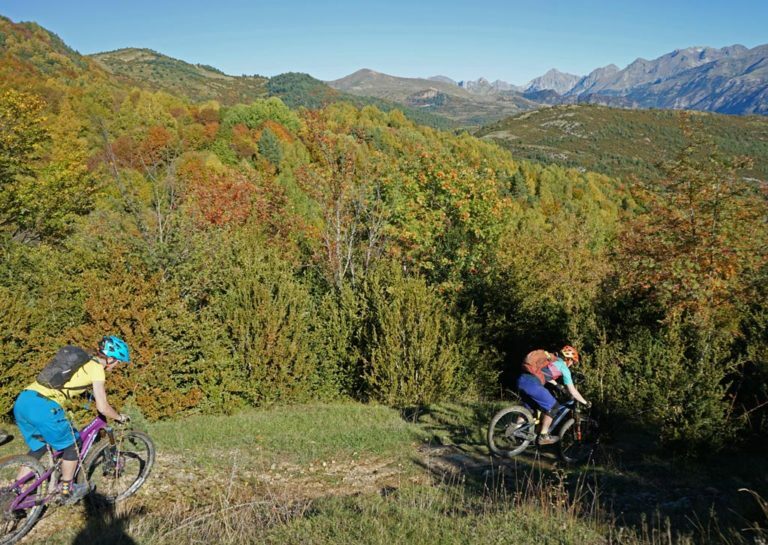 We rode some more trails near Biescas. The weather remained warm and dry, but different weather systems were approaching. We rode more trails built and maintained by Andres. 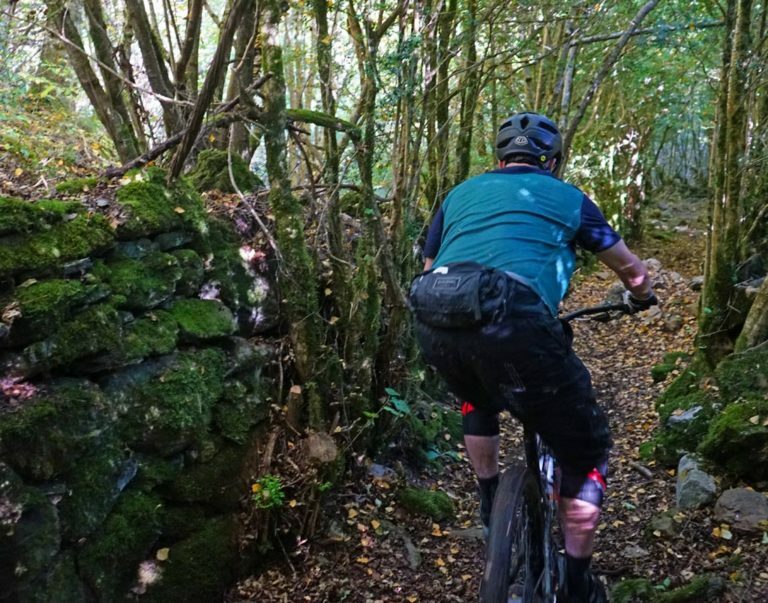 When I asked Andres if there were any conflicts with other trail users in the area he looked at me with an odd look that said, “conflict with who?” Nobody uses these trails as most of the young people have left, and the older people see the mountains as places for work, not recreation. 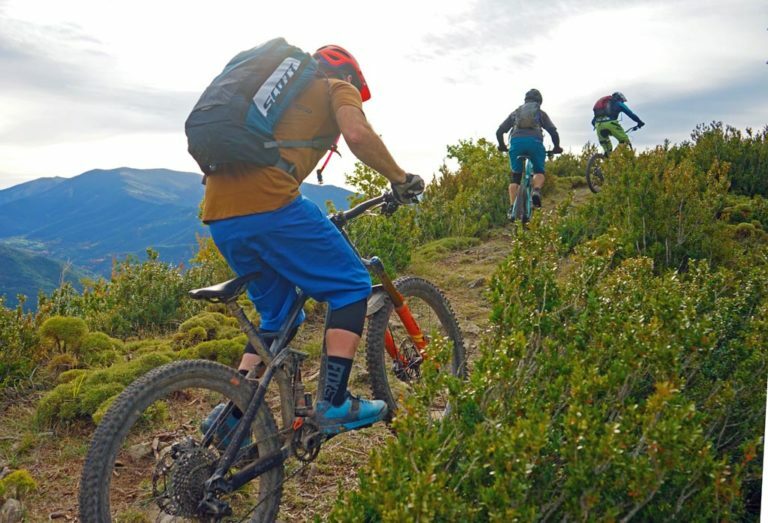 The only real users are the hikers and bikers. Yay us! 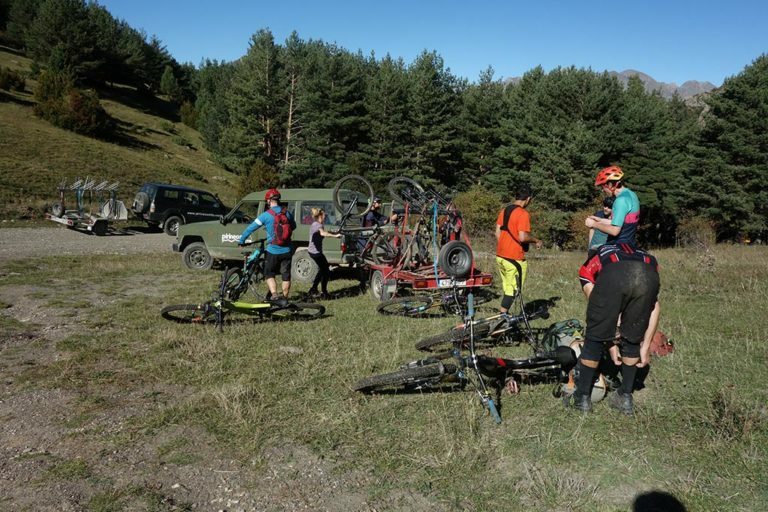 We descended 1600m and climbed 790m on trails including Sobremon and then Arrieras. 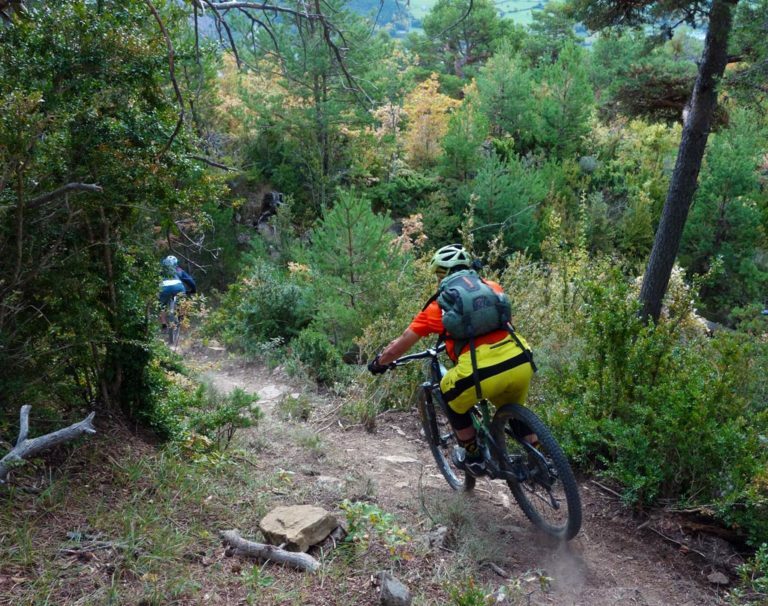 The latter is a trail the indefatigable Andres has rerouted to make it more sustainable. We finished off with Punta Punero. 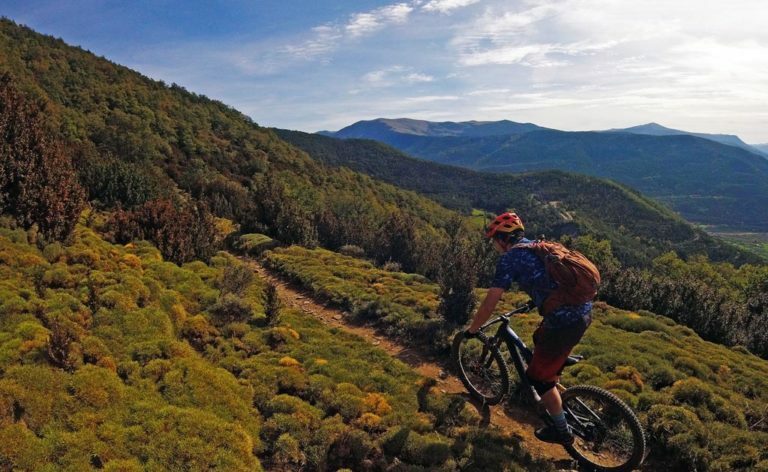 Prime trails. Where is everyone else? 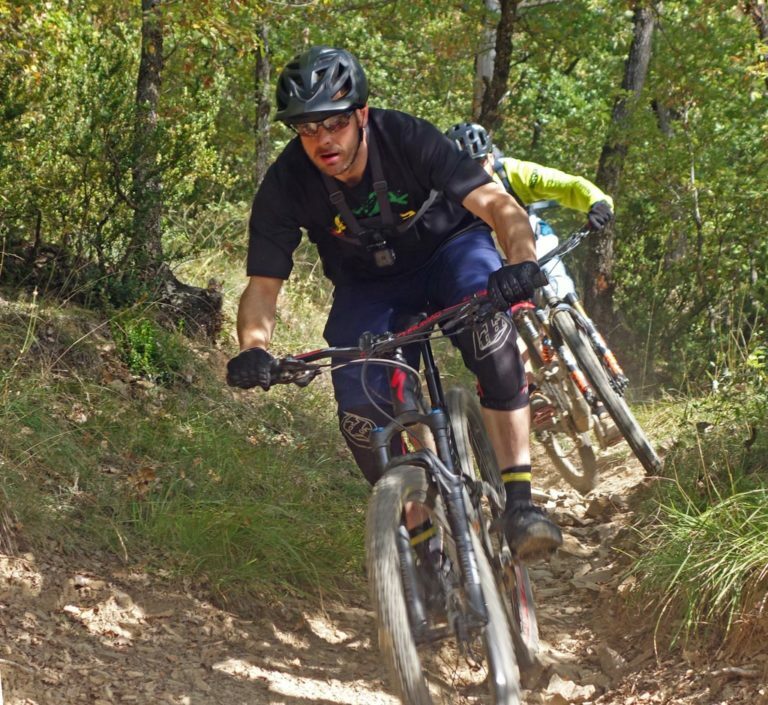 Hanging out at the top of the second descent, called Arrieras, which was going to be used as an Enduro race course that weekend. The race was canceled due to rain in the forecast which was good because it snowed 30cm the following week. I just kept thinking about the ski potential! Regroup for our third and final lap. 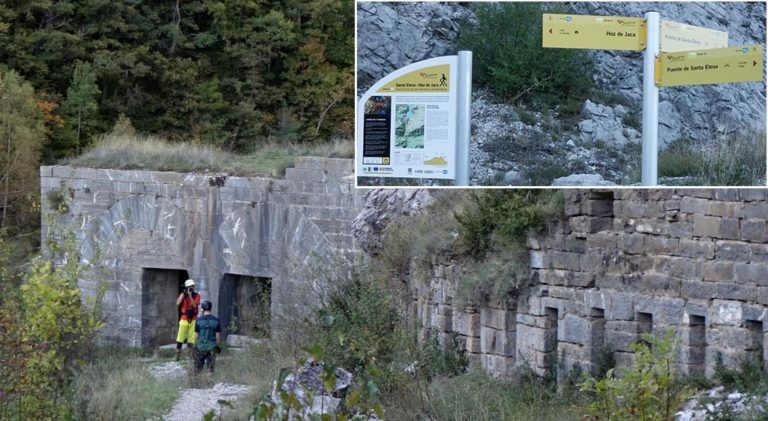 Trailhead signs are funded by IMBA and installed by Andres. Lunch with Mark, Matt, Finn, Rob, Doug, Joel, Mark and Steve. 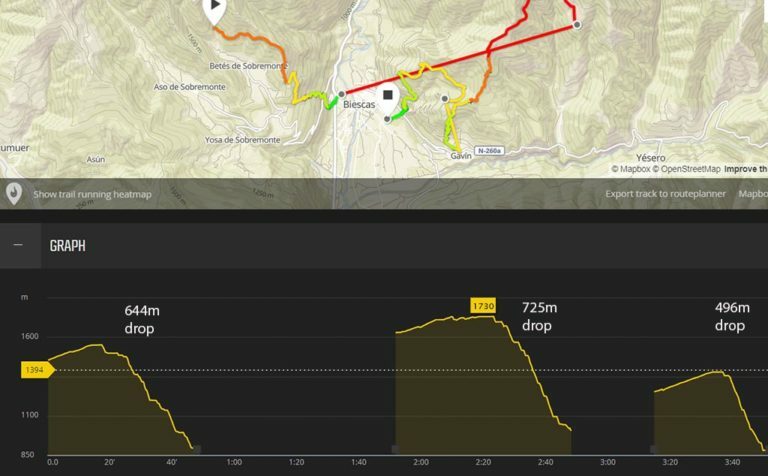 Elevation profile for our final day of mountain biking in the Pyrenees.